Whenever I am lucky enough to eat at Ray’s Boathouse in Seattle, I almost always order their Chatham Strait Sablefish in Sake Kasu. 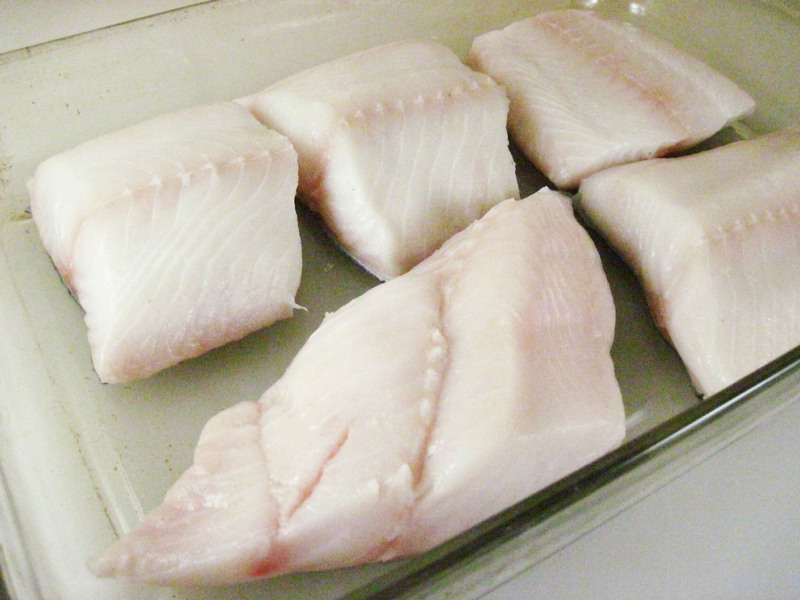 Sablefish, also known as Black Cod, has a rich, oily flesh with as much healthy Omega 3’s as salmon. And it tastes terrific! Black Cod can be prepared simply, perhaps grilled or broiled, but Laura requested Black Cod in Sake Kasu for her birthday so I decided to give it a try. I happen to have a copy of Ray’s Boathouse: Seafood Secrets of the Pacific Northwest and it has the restaurant’s recipe. Reading it, I realized why I had never made it before. It takes 48 hours to allow time for marinating. So you have to plan ahead. Fortunately, Laura requested it with plenty of time to make it work. The recipe is not at all difficult, but if you don’t have a Japanese market nearby, it may be hard to find the Kasuzuke Paste. I found it at Uwajimaya, a large Japanese grocery and gift store in Seattle. 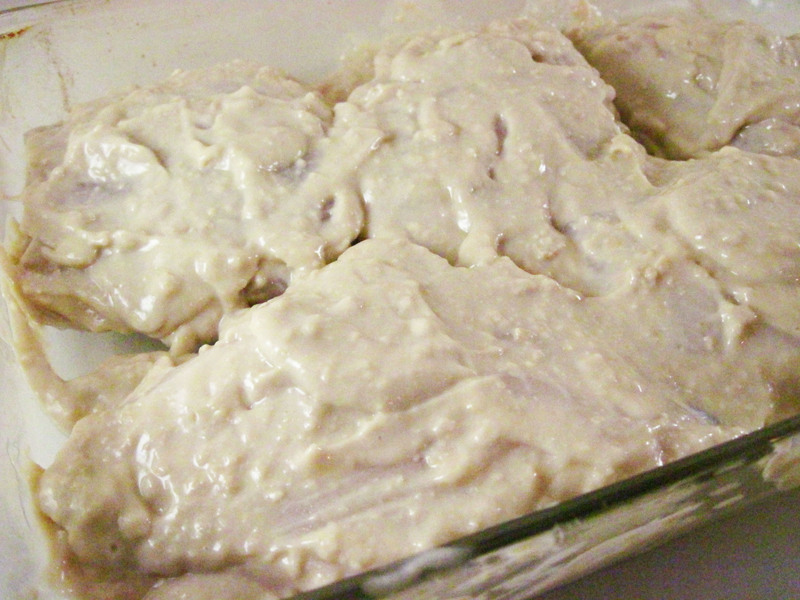 When it was time to make the marinade, the recipe suggested mixing it an electric mixer. I found that difficult to do because the paste is quite dense. I was pressed for time, so I finally decided it was mixed well enough and proceeded with the recipe. Next time, I will definitely try mixing it in my food processor, which I think will work much better. Grilled on my gas grill, and served with basmati rice and a cucumber salad, the Black Cod in Sake Kasu was a big hit with almost everyone. Bob thought it was too salty, but no one else agreed with him. So there you go. Would I make it again? 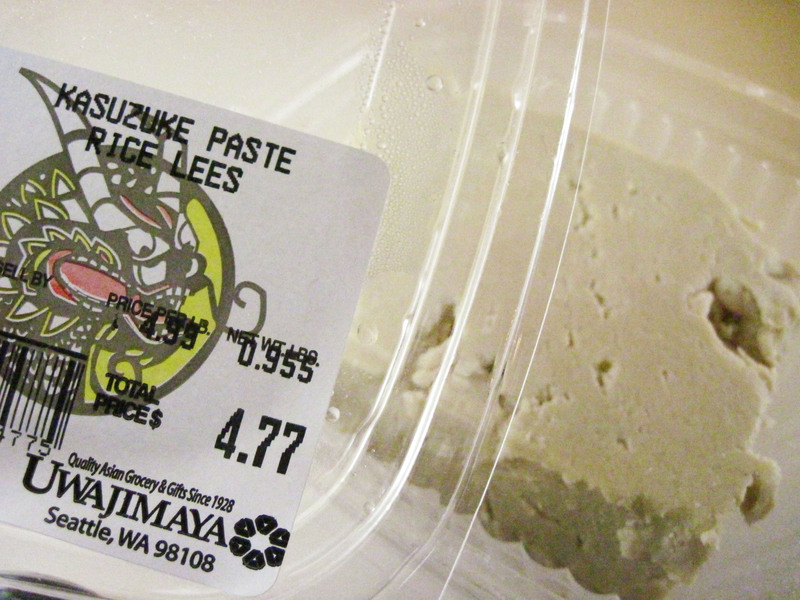 I have quite a bit of Kasuzuke Paste left; I froze it, so I probably will make it again. However, after I had already purchased the black cod and the Kasuzuke Paste, I learned via blogger Matt Wright that Uwajimaya and Mutual Fish both carry marinated Black Cod in Sake Kasu! It’s nice to know that it can be a last-minute dinner decision in the future! 1. 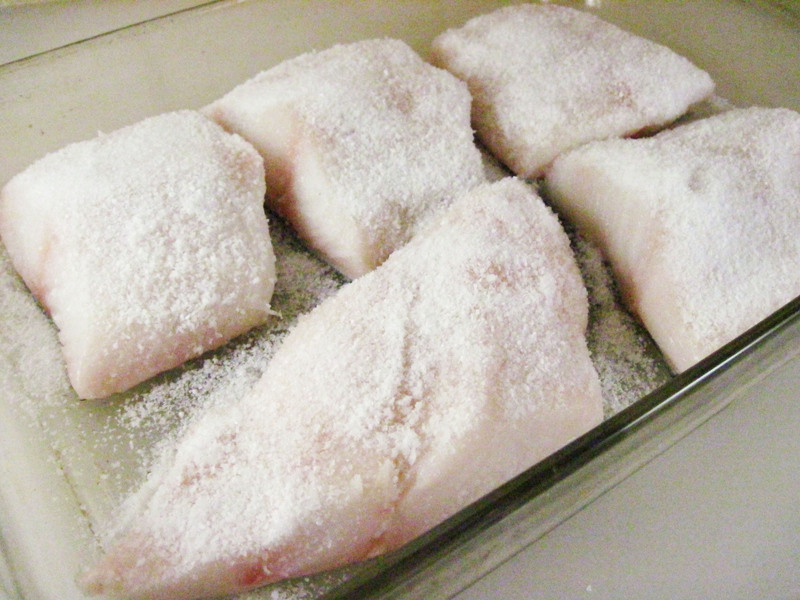 Put the cod pieces in a single layer, skin-side down in a large glass baking pan. 2. Sprinkle the salt all over the fish. Cover, and refrigerate for 24 hours. 1. Rinse the cod well and dry with paper towels. Wash and dry the glass baking pan and put the cod, skin-side down, back in the clean pan. 3. Cover the cod with the mixture, turning the pieces over so they are completely covered. Leave them skin-side down. Cover with plastic wrap and refrigerate for another 24 hours. 1. Scrape most of the Kasuzuke mixture off of the fillets, leaving a bit on to caramelize. 2. Heat your grill. Grill flesh-side down for about 5 minutes. Turn the fillets and grill for an additional 5 minutes. Enjoy! I have never been to Ray’s Boathouse but thanks for the recommendation to try it! Uwajimaya is my favorite store to find treasures. My dad likes the one in Renton when they have their live Hawaiian music and dancing. 🙂 I’ve never used Kasuzuke but I’d like to give it a try. Thanks for your comment, Dionne! I might have to check out the Renton Uwajimaya sometime! Ray’s has been one of my favorite restaurants for a long time. Ray’s Cafe is more casual (and less expensive), but it offers many of the same things as the Boathouse, including the Sablefish in Sake Kasu. I have yet to go to Seattle (although I lived in Tacoma for a month)… This looks really good! I’m so excited to have try out this recipe. This is one of the foods for my wedding buffet at Ray’s in August. I was so impressed with it when I tried it the first time. Try it, Charleen; you will love it! It is so good! We’re grilling this up as we speak! I can’t wait to give it a try. 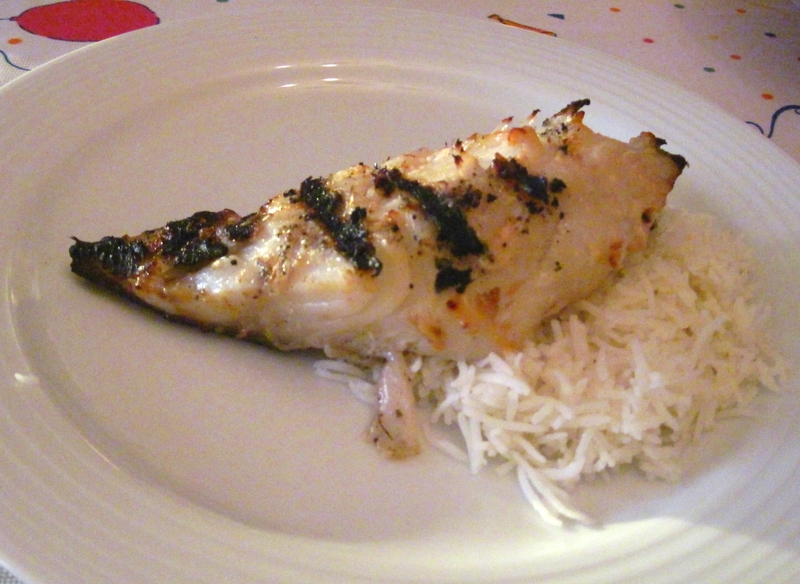 Black cod is one of my favorite fish – how fun to be able to cook it at home! Update: this was SO GOOD! We can’t wait to cook it again!